This article is about time in the Chinese mainland. For time in Hong Kong, see Hong Kong Time. For time in the Taiwan area, see Time in Taiwan. For traditional Chinese time-keeping, see Chinese calendar and Traditional Chinese timekeeping. The time in China follows a single standard time offset of UTC+08:00 (eight hours ahead of Coordinated Universal Time), despite China spanning five geographical time zones. The official national standard time is called Beijing Time (Chinese: 北京时间) domestically  and China Standard Time (CST) internationally. Daylight saving time has not been observed since 1991. The special administrative regions (SARs) maintain their own time authorities, with standards called Hong Kong Time (香港時間) and Macau Standard Time (澳門標準時間). These have been equivalent to Beijing time since 1992. In addition, it has been proposed during 2005's NPC & CPPCC of China that provinces in the west (such as Shaanxi, Sichuan, and Chongqing) should use the time offset of UTC+07:00. However, this proposal has not been voted upon yet. In the 1870s, the Shanghai Xujiahui Observatory was constructed by a French Catholic missionary. In 1880s officials in Shanghai French Concession started to provide a time announcement service using the Shanghai Mean Solar Time provided by the aforementioned observatory for ships into and out of Shanghai. By the end of 19th century, the time standard provided by the observatory had been switched to UTC+08:00. The practice has spread to other coastal ports, and in 1902 the "Coastal Time" was proposed to be the universal timezone for all the coastal ports in China. However, the timezone for the rest of China remained undetermined. Until 1913, the official time standard for the whole of China was still the apparent solar time of Beijing, the capital of the country at the time. Starting in 1914, the Republic of China government began adopting the Beijing Local Mean Solar Time as the official time standard. By 1918, five standard time zones had been proposed by the Central Observatory of Beiyang government of Republic of China, including the Kunlun (UTC+05:30), Sinkiang-Tibet (UTC+06:00), Kansu-Szechwan (UTC+07:00), Chungyuan (UTC+08:00), and Changpai (UTC+08:30). After the defeat of Beiyang government in 1928, the mission of the Central Observatory was moved to Nanjing, and the reference time standard used for the construction of traditional Chinese Calendar was shifted from Beijing Mean Solar Time to UTC+08:00. In 1930s, the proposed five timezones had not been fully observed, causing regions in inner China area to adopt their own time standards, resulting in chaos. On 9 March 1939, when the Ministry of the Interior organized a Standard Time Conference in Chongqing, it was decided to adopt the five timezone proposal with slight modification of their borders starting from 1 June, however it was also decided that the entire country would use the Kansu-Szechwan Time (UTC+07:00) during the Second Sino-Japanese War which began at the time. Following the end of World War II, the five-timezone system was resumed, although there is little information about the historical usage of time in the Kunlun and Changpai zones. A further refined system with adjustment to zone assignment in the Northwest part of Gansu was announced in 1947 for adoption in 1948. However, as the Chinese Civil War came to its end in 1949-1950, regional governments under the influence of Communist Party of China, other than those in Xinjiang and Tibet, switched to use the same time as Beijing, which is UTC+08:00, and is later known as Beijing Time or China Standard Time. There are two independent sources that claim the Communist Party of China, and/or the People's Republic of China, were using apparent solar time for Beijing Time before the period between 27 September 1949 and 6 October 1949, and they adopted the time of UTC+08:00 within that period of time, but such claim is dubious. Daylight saving time was observed from 1945 to 1948, and from 1986 to 1991. In 1997 and 1999, Hong Kong and Macau were transferred to China from the United Kingdom and Portugal and they were established as special administrative regions. Although the sovereignty of the SARs belongs to China, they retain their own policies regarding time zones for historical reasons. Due to their geographical locations, both are within the UTC+08:00 time zone, which is the same as the national standard — Beijing time. The border with Afghanistan at the Wakhjir Pass has the sharpest official change of clocks of any international land frontier: UTC+08:00 in China to UTC+04:30 in Afghanistan. In Xinjiang, two time standards, namely, Beijing Time and Xinjiang Time, are used in parallel. Xinjiang Time, also known as Ürümqi Time (Chinese: 乌鲁木齐时间; pinyin: Wūlǔmùqí Shíjiān), is set due to its geographical location in the westernmost part of the country. The time offset is UTC+06:00, which is two hours behind Beijing, and is shared with neighbouring Kazakhstan and Kyrgyzstan. Currently, timezone usage within Xinjiang is roughly split along the ethnic divide, with most ethnic Han following Beijing time and most ethnic Uyghurs following Ürümqi Time. [unreliable source?] Some local authorities are now using both time standards side by side. Television stations schedule programmes in different time standards according to their nature. Regardless, Beijing Time users in Xinjiang usually schedule their daily activities two hours later than those who live in eastern China. As such, stores and offices in Xinjiang are commonly open from 10am to 7pm Beijing Time, which equals 8am to 5pm in Ürümqi Time. This is known as the work/rest time in Xinjiang. In most areas of Xinjiang, the opening time of local authorities is additionally modified by shifting the morning session 30–60 minutes backward and the afternoon session 30 minutes forward to extend the lunch break for 60–90 minutes, so as to avoid the intense heat during noon time in the area during summer. Hong Kong maintains its own time authority after transfer of sovereignty in 1997. The Hong Kong Time (Chinese: 香港時間; pinyin: Xiānggǎng Shíjiān; Cantonese Yale: Hēunggóng sìgaan) is UTC+08:00 all year round, and daylight saving time has not been used since 1979. Greenwich Mean Time was adopted as the basis in 1904, and UTC was adopted as a standard in 1972. Before that, local time was determined by astronomical observations at Hong Kong Observatory using a 6-inch Lee Equatorial and a 3-inch Transit Circle. Macau maintains its own time authority after transfer of sovereignty in 1999. The Macau Standard Time (Chinese: 澳門標準時間; pinyin: Àomén Biāozhǔn Shíjiān; Portuguese: Hora Oficial de Macau) is the time in Macau. The time is UTC+08:00 all year round, and daylight saving time has not been used since 1980. 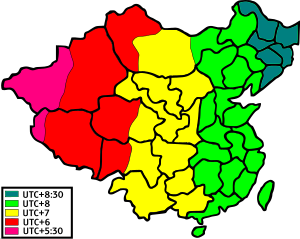 The territory of the People's Republic of China is covered in the IANA time zone database by the following zones. The reason why Asia/Shanghai is used instead of Beijing is because Shanghai is the most populous location in the zone. Columns marked with * are from the file zone.tab of the database. The following zones, including Asia/Kashgar, Asia/Chongqing, and Asia/Harbin, are kept in the "backzone" file of the IANA timezone database for backward compatibility. ^ "时间的概念". 国家授时中心科普网站. Archived from the original on 16 October 2012. ^ "CST – China Standard Time (Time Zone Abbreviation)". timeanddate.com. ^ a b "冷知识："北京时间"的由来" (in Chinese). 新华网. 3 November 2015. Retrieved 3 November 2015. ^ a b c d e f g h i j GUO, Qing-sheng (2001). "中国标准时制考" [A Study on the Standard Time Changes for the Past 100 Years in China] (PDF). China Historical Materials of Science and Technology (in Chinese). 22 (3): 269–280. 1000-0798(2001)03-0269-12. Archived from the original (PDF) on 20 December 2016. Retrieved 9 December 2016. ^ ""北京时间"是怎么来的". 北京日报. 28 October 2015. ^ "NOAA Solar Calculator". NOAA. Retrieved 14 March 2014. ^ "Bending Time in Xinjiang". ^ a b "作息时间". Archived from the original on 12 October 2014. ^ "10点日出，半夜吃饭，在新疆用北京时间的烦恼". 纽约时报中文网国际纵览. 17 June 2016. ^ "【城市】乌鲁木齐：没有屋顶的博物馆". 南方周末. Archived from the original on 21 December 2016. ^ "Clocks square off in China's far west". Los Angeles Times. 31 March 2009. ^ "政协委员建议：调整新疆单位作息时间". 人民网. 17 January 2014. ^ "O SERVIÇO DE <<HORA EXACTA>> NA INTERNET". Smg.gov.mo. Archived from the original on 16 July 2011. Retrieved 27 March 2011.